It adopits world-famous brand frequency conversion control,and is equipped with imported high-precision multi-circlepotentiometer and lockable dial,so the flow can be regulated to be steady and accurate,with the negative deviation to be less than 0.5%,and the positive deviation to beless than 1.5%. The magnetic gear stainless steel pump is imported from japan,with reliable quality and long service life. The complete stainless steel mould enclosure elegant and natural. Convenient for cleaning and sterilizing. Full function, automatic or manual. available Can be ooperated in the pleoduction line. 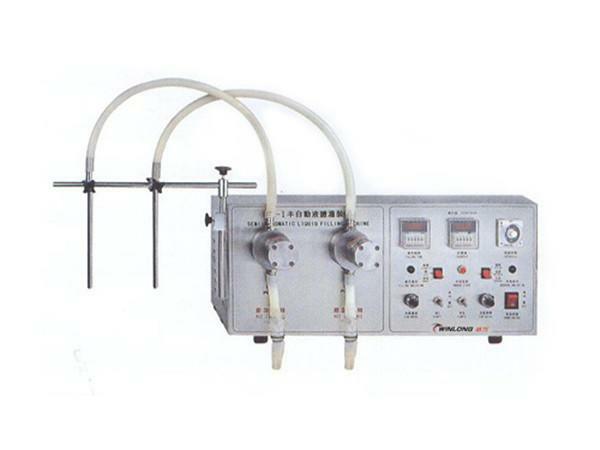 Can be equipped with several filling nozzies,and for the normal models,include:single pump machine,double pumpo maching and four-pump machine. Can fill most types of liquids,including high-viscosity liquid.For instance,agranular liquids such as:medicine,chemical,oilm,cosmetics and food. The filling capacity of SF-1 can be regulated from 20ml to 80000ml , and they can be conveniently.